Firefighters call airdrops "CNN Drops" because they're often useless, but politicians order them in order to produce a TV-friendly spectacle that reassures voters that Something is Being Done. The use of airdrops is spiking the cost of fighting wildfires: up to $296m from $171m in 2004 -- about 20% of the Forest Service's firefighting budget. And the companies that do the airdrops for the Forest Service are private contractors who make bank every time they do a run. Firedrops are mostly useful while firefighters are mobilizing and marshalling fire suppression equipment, but after that they are of limited use. The private forces are offset by military aircraft, which politicians love because they look great on television. It costs up to $14,000 a day to keep an air tanker on call and as much as $4,200 per hour to put it in the air. Heavy-duty helicopters, the workhorses of aerial firefighting, can cost $32,000 a day on standby, plus $6,300 per hour of flight time. 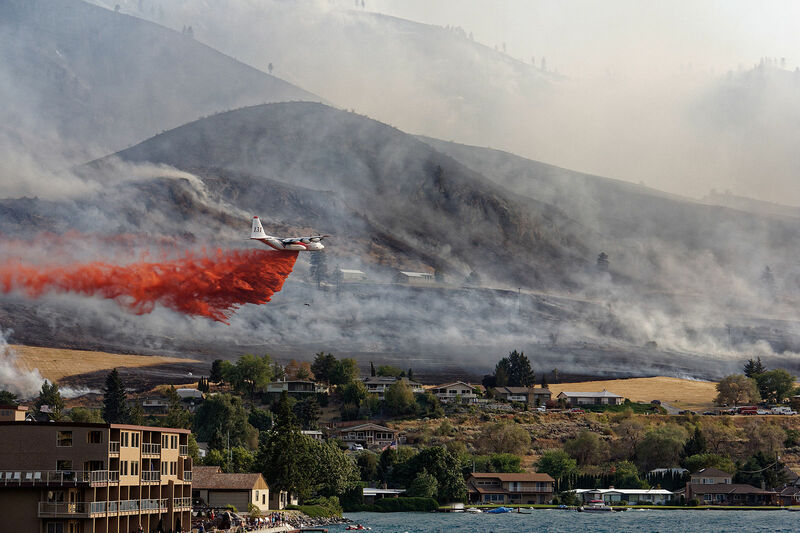 "When you deal with aviation on a wildland fire, you have a big bank in the sky that opens up and showers money," said Timothy Ingalsbee, a former Forest Service and National Park Service firefighter who has criticized federal firefighting and forest management practices.